International Journal of Research in Health Sciences,2018,6,1,31-36. Alcoholic and Nicotine dependence syndrome is as a cluster of physiological and psychological including behavioral and cognitive phenomena in which the use of a substance takes on much higher priority for individual than other behaviors that once had greater value. The major objective of this study is to compare and assess the biochemical and haematological markers observed in patients with alcohol and nicotine dependent syndrome in comparison to those with only alcohol dependent syndrome group. A total of 50 male patients with alcohol and nicotine dependent syndrome were included. As a control group, 50 male patients with alcohol dependent syndrome only and 25 male normal healthy volunteers also included. 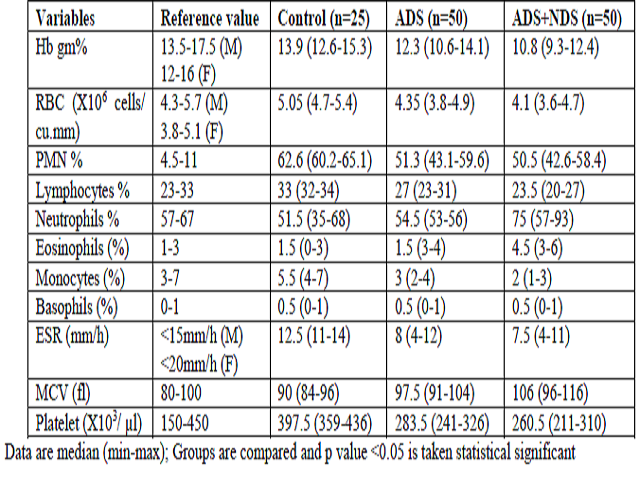 The liver function marker enzymes and haematological parameters were analyzed. The hepato function markers including alanine aminotransferases, aspartate aminotransferases, alkaline phosphatase and gamma glutamyl transferase were significantly elevated in patients with both the syndrome, in comparison to patients with alcoholic dependence syndrome and healthy controls. The haemoglobin, total RBC, polymorphonuclear cells were significantly decreased in only alcoholic dependence syndrome group compared to controls and MCV and ESR were elevated in patients with alcoholic and nicotine dependence syndrome. Not much variation is observed between patients with alcoholic - nicotine dependence syndrome and alcoholic dependence syndrome only. The evidence of changes in the biochemical and hematological parameters in patients were observed only on alcohol dependent syndrome and clearly depicting that it acts as markers of alcoholism.